On this invigorating cruise to Belgium and the Netherlands, you’ll have chances to experience memorable water-based exploration, both on board Boudicca and during calls at compelling destinations. As well as enjoying relaxing evening sailings of winding rivers and waterways, you could take canal boat tours of beautiful cities to uncover sights and highlights to savour. Your rewarding week away begins with an overnight sail from Dover to the Netherlands, where Amsterdam – the diverse Dutch capital – awaits. Attractions are in abundance here, from the haunting Anne Frank House to a comprehensive collection of world-renowned galleries and museums including the Rijksmuseum and Van Gogh Museum; take advantage of your overnight stay to take your pick of the highlights. Highly recommended is a boat tour of Amsterdam’s iconic canals. You could opt to enjoy a tour during the day, in the evening or both; the fine architecture of the UNESCO-listed Canal Ring are equally fascinating before and after nightfall. Rotterdam – the Netherlands’ stylish second city – brings futuristic sights to your cruise, after departing Amsterdam via the Nordzeekanaal. Rotterdam’s modern bridges and towers are a sight to behold as you glide into port, while there are plenty of impressive sights to discover once you head ashore too; the innovative 1970’s Cube Houses and magnificent Markthal are well worth taking the time to visit. An evening scenic cruise along Nieuwe Maas concludes your time in the Netherlands, before Boudicca sails south to Belgium. Ghent is the first of two Belgian delights on your itinerary. This enchanting medieval city showcases a collection of interesting attractions, including the striking gothic structures of St Bavo’s Cathedral and the Castle of the Counts, and the UNESCO-listed, 91-metre-high Belfry. The highlights of Ghent are easily discovered on foot or via the tram; though you may opt to embark on another magical canal boat tour here. However you choose to explore, don’t miss the chance to sample authentic Belgian chocolate expertly crafted by the city’s artisan chocolatiers. 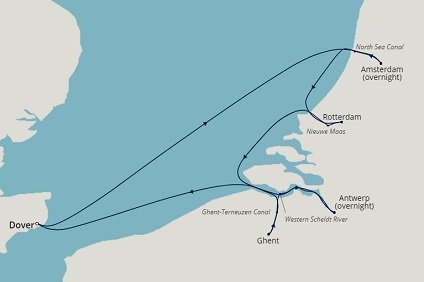 After another evening of scenic cruising along the Ghent-Terneuzen Canal, you cruise concludes with a call at Antwerp. Once you’ve arrived in Belgium’s beautiful second city, you’ll have time to explore at your own pace during an overnight stay. While the legendary diamond district is the jewel in Antwerp’s crown, there are plenty of other treasures to uncover here too; the intricate guildhouses of Grote Markt, the mighty Cathedral of our Lady and the Royal Museum of Fine Arts are all highly recommended. A riverside fortress and numerous intriguing cobbled streets are overshadowed by the 123m high tower of the imposing Cathedral of Our Lady, the biggest church in Benelux. Its construction started in 1352 on the site of a 10th century chapel, but like many medieval religious buildings, it took several centuries to complete. The cathedral interior has four altarpieces by Peter Paul Rubens – a true legend of baroque painting. The Royal Museum of Fine Arts is dedicated to this local celebrity, and houses many of his finest works, along with those of other Flemish masters. There are more than 20 other museums in the city, and other attractions to this cultural gem of a city include a vibrant fashion and entertainment scene, a robust café culture, excellent shops and delightful parks and gardens. Fine dining is also on the menu, and one of Antwerp's most dramatic restaurant, The Jane, brings it all together with a slice of rock and roll. Innovative and inspiring nicely sums up Rotterdam, the major port city in the Dutch province of South Holland. The Netherlands' second largest city has a diverse community, a captivating maritime history, and an abundance of excellent museums. The city is like an exhibition of futuristic architecture, an achievement made even more remarkable given Rotterdam was literally razed to the ground during World War II. The north side of the city is easy to discover on foot. The Maritime Museum has vintage ships and exhibits that trace the city's seafaring history, while the Pilgrim Fathers Church is the site where pilgrims worshipped before embarking for America. Split by the imposing Nieuwe Maas shipping channel, the city is crossed by a collection of tunnels and bridges, notably the dramatic Erasmusbrug – nick-named “the swan”. The innovative Cube Houses, tilted at 45 degrees, are a quirky discovery, as is the Schouwburgplein square. The renowned Blijdorp Zoological Garden, is also worth a visit.